The Veiled Chameleon, Chamaeleo calyptratus, is one of the larger species of chameleon found in the mountain regions of Yemen, the United Arab Emirates, and Saudi Arabia. It is also sometimes referred to as the Yemen Chameleon. Veiled Chameleons are one of about 80 species of what is known as Old World Chameleons, also called true chameleons. They can be aggressive and are usually brightly coloured. They have a casque, a helmet-like ridge, on top of their heads, which is a tiny swelling as a hatchling, but grows to 5cm [2in] in height as the animal matures. As hatchlings, they are usually a pastel green, but as they mature they acquire bold bands of bright gold, green, and blue, mixed with yellow, orange, or black, that circle their body. The males are usually more strikingly coloured than the females, which are usually shades of green mottled with shades of tan, orange, white, and sometimes yellow. Male chameleons of the species have small spurs or heels on the backs their rear feet, while females do not. This spur is present on males from hatching, and can grow larger with maturity. Adult males are relatively large for reptiles. They can reach an overall length of 24 inches (60 cm). Most specimens usually grow to between 14 and 18 in (35–45 cm). Females are smaller, with the average overall length being just under 12 in (30 cm). 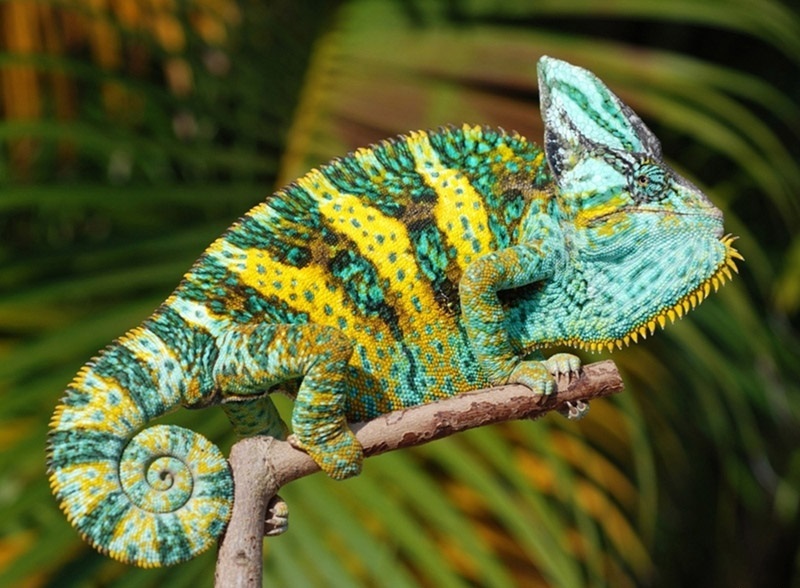 As with most Chameleons, the veiled Chameleon is a specialized tree dweller. It has a flattened body meant to mimic a leaf, and feet specially designed for grasping limbs and branches. Its prehensile tail is like a fifth appendage and aids in climbing. Its eyes work independently of one another, allowing the chameleon to look in front of and behind itself at the same time. Its long tongue, contrary to popular belief, is not sticky, but instead has a muscular structure on the end which physically grips to capture insect prey. The veiled chameleon is an ambush predator, and is capable of lying still for very long times, waiting for an unsuspecting locust or other prey to wander by. Veiled chameleons are omnivores. While their main diets consist of insects, they will occasionally consume the leaves, blossoms, and fruit of various plants. This is especially true in times of drought. Like all chameleons, veiled chameleons prefer to drink water in drops on leaves. They do not always recognize standing water, and may dehydrate if that is their only source. Click HERE for a Veiled Chameleon care sheet.